Total: 1 hr. 11 min. 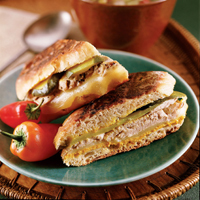 This healthier version of a traditional Cuban sandwich gives the same delicious flavor and high-quality protein but with less of the saturated fat. Preheat the oven to 425°F. Coat a wire rack with cooking spray and place on a shallow baking pan. Rub the pork tenderloin with the olive oil. Sprinkle with the garlic salt and pepper. Roast for 30 to 35 minutes, or until a meat thermometer inserted into the center of the pork registers 155°F and the juices run clear. Cool the pork for 15 minutes. Thinly slice the meat against the grain. Spread the cut side of the bottom half of the bread with the mustard. Top each with the cheese, pork, and an overlapping layer of pickle slices. Top with the remaining bread halves. Heat a large nonstick skillet over medium heat. Add the sandwiches top side down and place another heavy skillet on top of the sandwiches, pressing down slightly to help flatten. Cook for 6 minutes. Turn the sandwiches over and replace the second skillet on top. Cook for 5 to 6 minutes, or until the cheese melts and the sandwiches are flat and heated through. Remove from the pan and cut each sandwich in half on a sharp angle. Serve immediately.